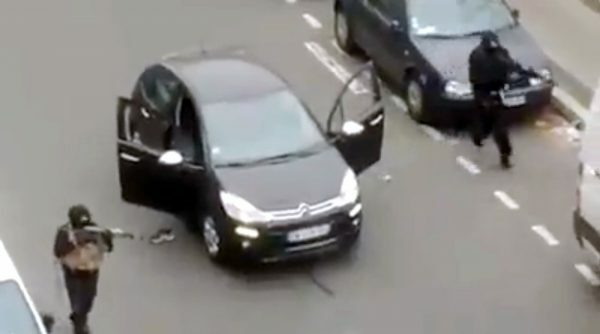 Just hours after a police officer was reportedly executed on the streets of Paris by Islamic terrorists, edited video footage of the incident has emerged. In the original video, played at normal speed, it appears that the officer pleading for his life was executed at point blank range. One Youtube publisher has slowed down the video and the new footage has raised some eyebrows. As depicted in the slow-motion version, it appears that the weapon being fired at the officer has no recoil. Moreover, the officer’s body does not seem to respond like it should when being shot at point blank with a 7.62×39 AK47 round and no blood is shown after the firearm is discharged at him. Some have suggested that the original video has been faked, though this is unlikely as other witness videos show that the incident did, in fact, happen. Moreover, at least 11 people have been confirmed dead in Paris. Another possibility is that the attacker missed his shot and the unarmed officer played dead after the fact. Paris police have not confirmed his death as of this writing, so this theory is unconfirmed. That is NOT a Head Shot! Bullet has gone through the Ballistic vest at upper shoulder, to exit in the front. Dust is from the STEEL CORE ammunition hitting sidewalk. Blood splatter contained by front vest. At 2600 ft. per sec. 126 gr. if it hit his head at that range his head would have exploded like a melon. His chest/internals are mush. Shock wave. At this point it is not clear exactly what has transpired and the public is awaiting news from Paris police on this matter. Editor’s Note: This article was published by The Daily Sheeple two days ago. I had no original thoughts of the Charlie Hebdo shootings being a false flag so I was not researching that possibility. I also failed to see the article until today. The hip-firing video seems to be similar to what the Charlie Hebdo shooter was doing but I did find another video that provides a possible, though not very likely, explanation. The below video is from a night club shooting in 2013. The part of the video that is important starts at around the 34 second mark. Notice, in this video, that the recoil is pushing the gun stock sideways. If you watch this, and then go back and watch the slow motion video that Mac Slavo shared, there is a very slight possibility that the alleged shooter of the police officer was so skilled that he was able to control a sideways thrust and flow with it back to his body. There is only a slight hint that this may have happened in the video. 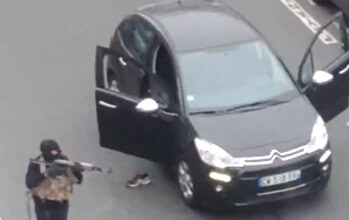 It looks quite seemless but if this shooter was an expert he may have pulled it off. Watch the below video and you will see what I mean. My gut feeling is that Mac Slavo and those who produced the slow motion video are correct in assuming that something is not right about this alleged police officer shooting.